Reading and share top 26 famous quotes and sayings about Maketh by famous authors and people. 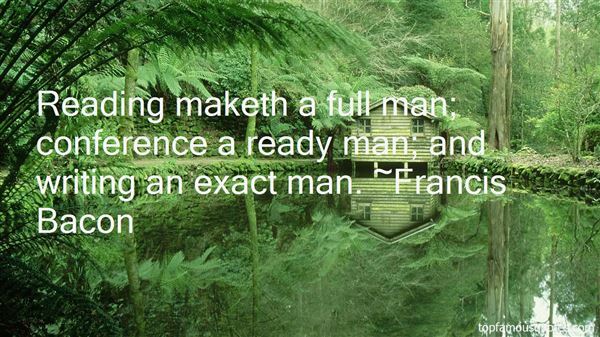 Browse top 26 famous quotes and sayings about Maketh by most favorite authors. 1. "The love of God is so universal that His perfect plan bestows many gifts on all of His children, even those who disobey His laws. Mortality is one such gift, bestowed on all who qualified in the War in Heaven (see Revelation 12:7–8). Another unconditional gift is the universal resurrection: 'For as in Adam all die, even so in Christ shall all be made alive' (1 Corinthians 15:22). Many other mortal gifts are not tied to our personal obedience to law. As Jesus taught, our Heavenly Father 'maketh his sun to rise on the evil and on the good, and sendeth rain on the just and on the unjust' (Matthew 5:45)." 2. "Nietzsche, in a rare moment of deep stillness, wrote, "For happiness, how little suffices for happiness!…the least thing precisely, the gentlest thing, the lightest thing, a lizard's rustling, a breath, a wisk, an eye glance—little maketh up the best happiness. Be still." 3. "It is the mind that maketh good of ill, that maketh wretch or happy, rich or poor." 4. "Well, come back and have tea with us," saidMoon-Face. "Silky's got some Pop Biscuits -andI've made some Google Buns. I don't often makethem-and I tell you they're a treat!" 5. "Reading maketh a full man; conference a ready man; and writing an exact man." 6. "Zarathustra, however, answered thus unto him who so spake: When one taketh his hump from the hunchback, then doth one take from him his spirit—so do the people teach. And when one giveth the blind man eyes, then doth he see too many bad things on the earth: so that he curseth him who healed him. He, however, who maketh the lame man run, inflicteth upon him the greatest in him — so do the people teach concerning cripples"
7. "A little poison now and then: that maketh pleasant dreams. And much poison at last for a pleasant death." 9. "Justice is not Healing. Healing cometh only by suffering and patience, and maketh no demand, not even for Justice. Justice worketh only within the bonds of things as they are... and therefore though Justice is itself good and desireth no further evil, it can but perpetuate the evil that was, and doth not prevent it from the bearing of fruit in sorrow." 10. "We may indeed in counsel point to the higher road, but we cannot compel any free creature to walk upon it. That leadeth to tyranny, which disfigureth good and maketh it seem hateful." 11. 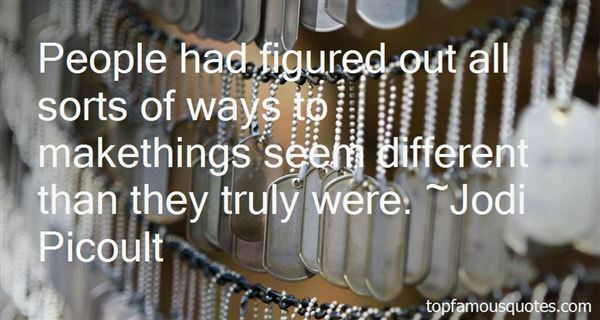 "People had figured out all sorts of ways to makethings seem different than they truly were." 12. "Most Like an Arch This MarriageBY JOHN CIARDIMost like an arch—an entrance which upholds and shores the stone-crush up the air like lace. Mass made idea, and idea held in place. A lock in time. Inside half-heaven unfolds.Most like an arch—two weaknesses that lean into a strength. Two fallings become firm. Two joined abeyances become a term naming the fact that teaches fact to mean.Not quite that? Not much less. World as it is, what's strong and separate falters. All I do at piling stone on stone apart from you is roofless around nothing. Till we kissI am no more than upright and unset. It is by falling in and in we makethe all-bearing point, for one another's sake, in faultless failing, raised by our own weight. (found online here: http://www.poetryfoundation.org/poem/...)"
13. "Up then, fair phoenix bride, frustrate the sun;Thyself from thine affectionTakest warmth enough, and from thine eyeAll lesser birds will take their jollity.Up, up, fair bride, and callThy stars from out their several boxes, takeThy rubies, pearls, and diamonds forth, and makeThyself a constellation of them all;And by their blazing signifyThat a great princess falls, but doth not die.Be thou a new star, that to us portendsEnds of much wonder; and be thou those ends." 14. "A hard beginning maketh a good ending." 15. "You would think, wouldn't you, that if you were the childof a happy marriage, then you ought to have a better thanaverage marriage yourself – either through some geneticinheritance or because you'd learnt from example? But itdoesn't seem to work like that. So perhaps you need theopposite example – to see mistakes in order not to makethem yourself. Except this would mean that the best way forparents to ensure their children have happy marriageswould be to have unhappy ones themselves. So what's theanswer?" 16. 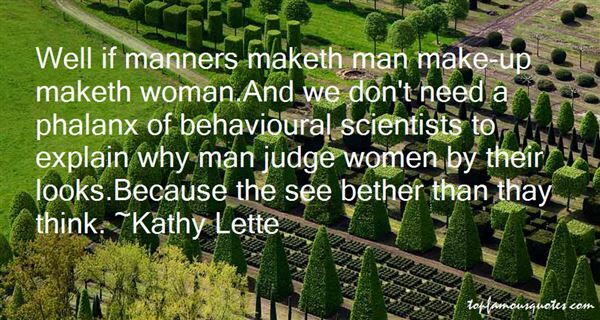 "Well if manners maketh man make-up maketh woman.And we don't need a phalanx of behavioural scientists to explain why man judge women by their looks.Because the see bether than thay think." 17. "Hereby we may understand that God, of His special grace, maketh the teachers of the gospel subject to the Cross, and to all kinds of afflicitons, for the salvation of themselves and of the people; for otherwise they could by no means beat down this beast which is called vain-glory." 18. "Hence, when we ask anything of God and He begins to hear us, He so often goes counter to our petitions that we imagine He is more angry with us now than before we prayed, and that He intends not to grant us our requests at all. All this God does, because it is His way first to destroy and annihilate what is in us before He gives us His gifts; for so we read in I Samuel 2:6: "The Lord killeth, and maketh alive: he bringeth down to the grave, and bringeth up." Through this most gracious counsel He makes us fit for His gifts and works. Only then are we qualified for His works and counsels when our own plans have been demolished and our own works are destroyed and we have become purely passive in our relation to Him." 19. "Writer's RhymeWord by wordline by line,I'm gonna make this writing fine.I'll reread'til I knowthat each sentence says it so.Check the grammarand the meaning;be the critic;do the screening.Dictionary's not for show;Helps me getthose words to flow.Watch the diet;hem it in.Do not fearto make it thin.Simple is a goal to praise;Let's untiethat wordy phrase.Every wordlet's be surefollows the lastwith meaning pure. "Won't be easy,"so 'tis said,but effort willput me ahead.Word by wordline by line,I'm gonnna makethis writing fine,even thoughit takes some time,I'm gonna make this writing fine;I'm gonna make this writing fine." 20. "Our erected wit maketh us to know what perfection is." 21. "Suffer not a whore to live, for she maketh a pit of her womb." 22. "There is no great and no smallTo the Soul that maketh all:And where it cometh, all things areAnd it cometh everywhere." 23. "From the time an Aiel boy becomes a man he will not sing anything but battle chants, or their dirge for the slain. I have heard them singing over their dead, and over those they have killed. That song is one to makethe stones weep." 24. "If "Manners maketh man," as someone saidThen he's the hero of the dayIt takes a man to suffer ignorance and smileBe yourself, no matter what they say. "(Englishman in New York)"
25. "He told me he loved me. He was supposed to protect me from hurt, not inflict it in the cruelest of ways. He betrayed me. I'm dying. I'm dead. Why am I still breathing? God, I don't know how to makethe hurt stop." 26. "One who, though he never digress to read a Lecture, Moral or Political, upon his own Text, nor enter into men's hearts, further than the Actions themselves evidently guide him…filleth his Narrations with that choice of matter, and ordereth them with that Judgement, and with such perspicuity and efficacy expresseth himself that (as Plutarch saith) he maketh his Auditor a Spectator. For he setteth his Reader in the Assemblies of the People, and in their Senates, at their debating; in the Streets, at their Seditions; and in the Field, at their Battels.Quoted by Shelby Foote in his The Civil War: A Narrative – Volume 2: Fredericksburg to Meridian, Bibliographical Note, from Thomas Hobbes' Forward to Hobbes' translation of The Peloponnesian War by Thucydides"
It's my special magical power. I can read your mind when you're thinking dirty thoughts. ""So, ninety-five percent of the time. "She craned her head back to look up at him. "Ninety-five percent? What's the other five percent? ""Oh, you know, the usual--demons I might kill, runes I need to learn, people who've annoyed me recently, people who've annoyed me not so recently, ducks.""Ducks?"